Let me back up a bit. 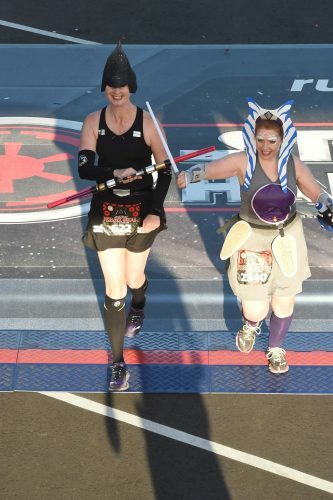 My running buddy Aimee and I are registered to run the Disneyland Paris Half Marathon later this year. If you run that one plus any race in the US this year, you get a special Castle to Chateau Challenge medal. 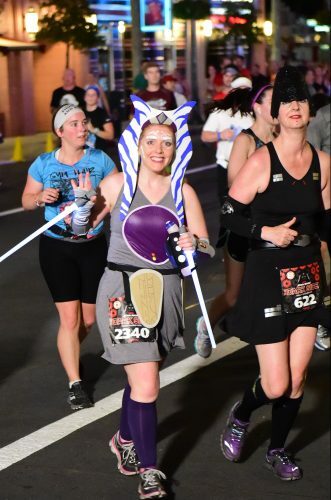 We were signed up to run the Princess Half in February as our US race, but Aimee had to cancel at the last minute and couldn’t make it, meaning she wouldn’t get the Castle to Chateau medal in Paris. 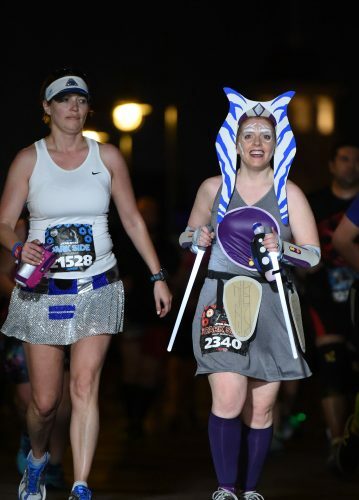 We were trying to think up another race she could do, and as fate would have it, runDisney had reopened the registration for the Star Wars Dark Side Half the day before. You should never fight fate, right? 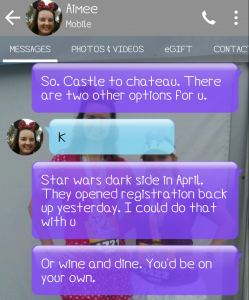 This text was sent at 8:18AM and we were registered, had a room and booked our flights by Noon. 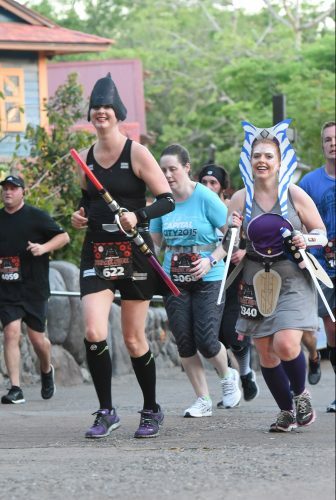 We used the force. Costume negotiations began immediately. 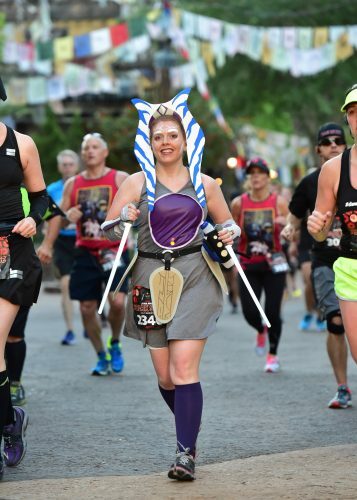 I already knew I wanted to be Ahsoka Tano from Star Wars Rebels. I started watching it back in the fall because Aimee’s kids asked me to make them Halloween costumes based on Ezra and Sabine from the show. I taped a couple of episodes for research and ended up getting hooked on it, especially Ahsoka’s story line. It’s a great show! Aimee is a huge Sarah Michelle Gellar fan, so she picked her character from the show, the Seventh Sister. 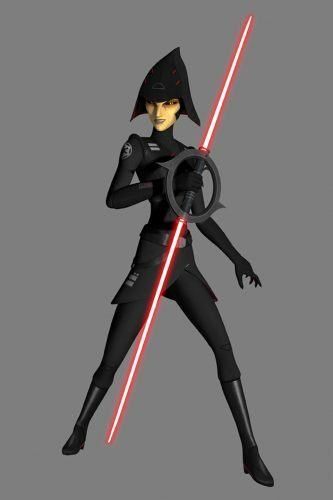 Seventh Sister also happens to be the person Darth Vader sends to hunt down and kill Ahsoka Tano. Dun, dun, dun! I used the new Jalie 3463 pattern to make the dress, and just altered it a bit in the front to make the curved crossover slit. For her hat, I studied pictures of the hat and drew what I thought the front, back and sides should look like. I then traced those sketches onto poster board for a test run, and then eventually onto glitter craft foam for the final draft. I also got her a black visor to wear in case she thought it would be too hot to wear the hat, but she insisted on wearing it to be more screen accurate. 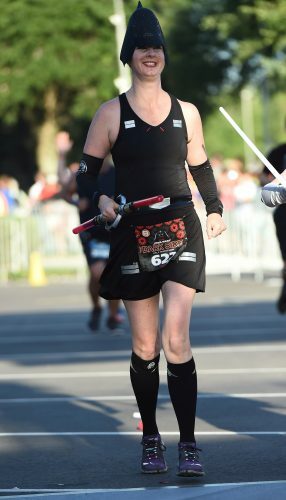 I think she looked awesome! 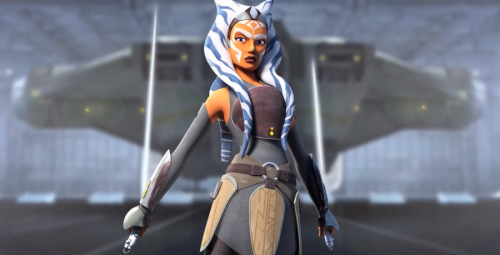 I used the same pattern for Ahsoka’s dress and just sewed on a circle of the new cosplay pleather from Joann’s for her chest armor. Her head tails were 3mm craft foam that I hand painted. For her belt, I used craft foam for the armor velcroed to black elastic and a curtain grommet for the ring. 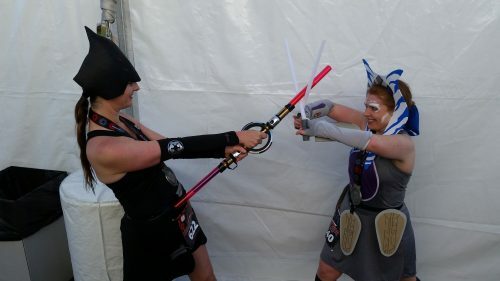 The lightsabers are $1 Walmart LED flashlights hot glued to Dollar Tree “light swords.” I made some elastic straps to hold them onto my hands so I didn’t have to waste energy gripping them the whole race and so I was free to grab water cups. 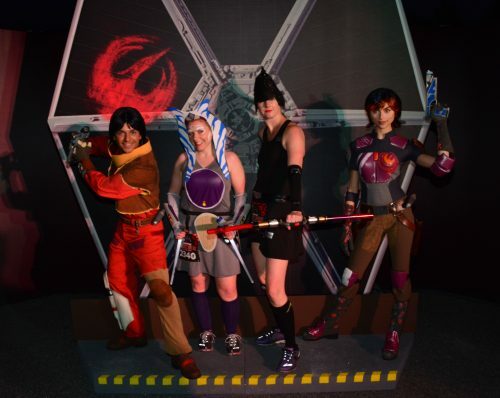 And we saw Ezra and Sabine from Star Wars Rebels. Ezra was fantastic! 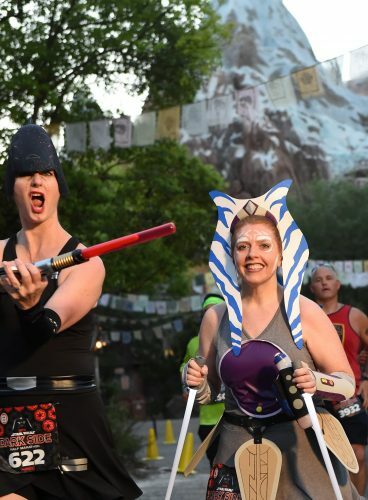 He joked that I shouldn’t be hanging out with Seventh Sister, and as we were leaving he noticed that the cast member taking our picture didn’t get the shot and he made her do it again. 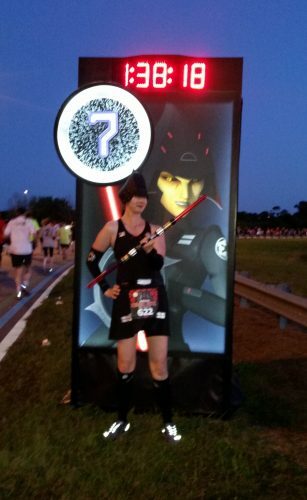 Then as we were leaving the second time, he told me to keep an eye on Seventh Sister. I promised I would! 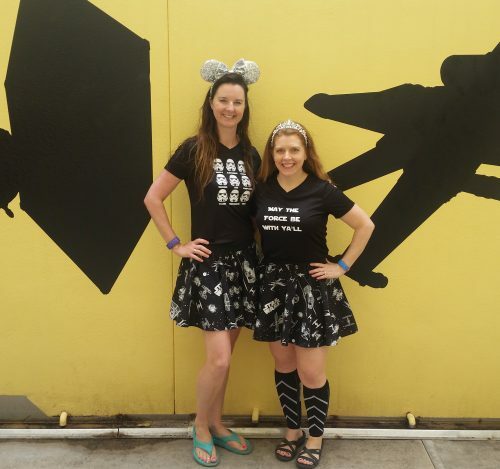 We ran around the Animal Kingdom parking lot for what seemed like forever, and eventually got to go in and run around the park. They have finally taken down all the “pardon our dust” fences that have been up for years and the park looks so open and amazing. We were getting pretty silly at this point. 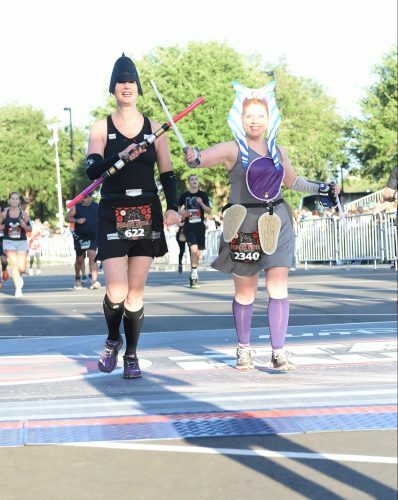 And then it was a quick 5k to the finish at the Wide World of Sports! 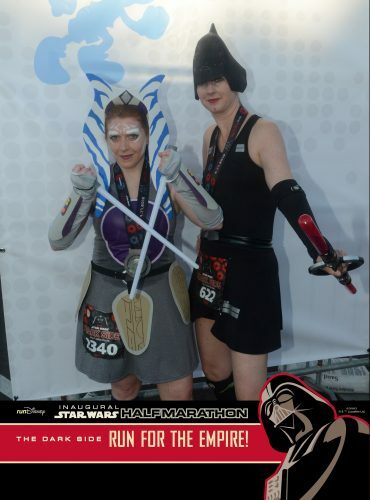 I was a little worried that no one would know who we were supposed to be, but tons of the spectators and even the volunteers would yell out “Go Ahsoka!” or “Hey Seventh Sister!” Star Wars fans really know their stuff! 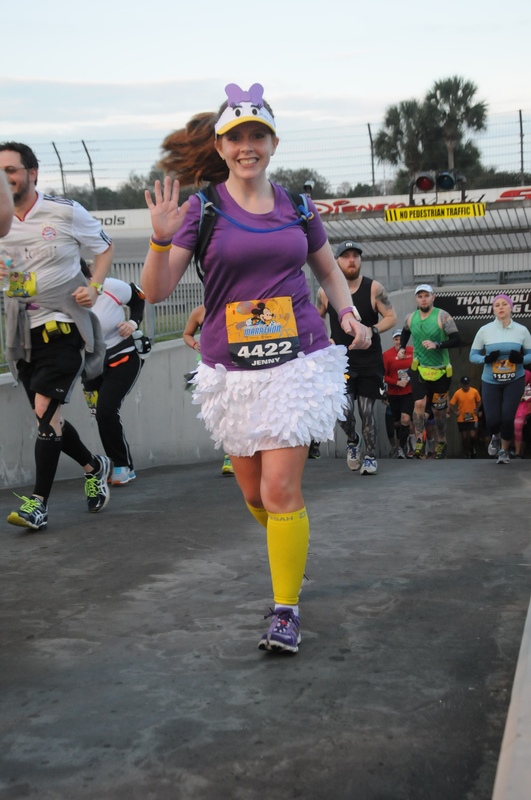 I highly recommend this race and can’t wait to do it again someday. Just think of all the fun costume possibilities! Looks like you had a blast your costumes are awesome. 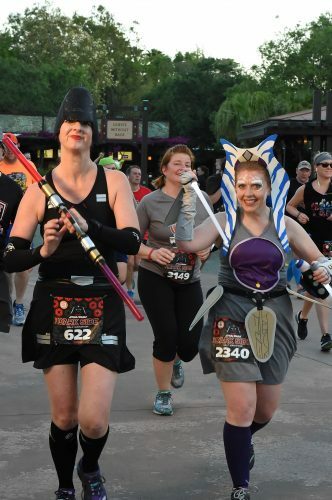 I always look forward to putting costumes together for Disney races!